Formal wears for men are very essential for their professional life and it is the window through which the society sees them and weighs them. Every man has to have a decent collection of formal wears to represent his personality. Though a man is don not have too many of them, a few decent ones are just enough for a well-brought-up impression. Mens suits are one of the important types of formal wears, off course we do have casual mens suits too but the formal ones are more prominent that the other. Right from important occasions like wedding, church ceremonies, official meetings, formal parties and other stuffs, a man will be required to wear a suit to represent his power. Right from the olden days, mens suits have taken an important place in a man's wardrobe. If you are planning to get a few good sets of mens suits for yourself or someone close to you, the first thing that you should do is to know well about the recent fashion in mens suits. Knowing about the latest trend will give you an idea about what you will get in the market. You should also try to know your sizes perfectly if you are going to buy readymade ones. 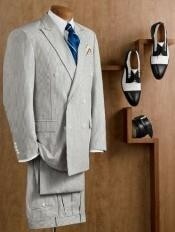 A suit should fit you like a glove and hence, size selection is very much important in the process. It is wise to select styles that are more versatile if you are planning to wear that suit for long time, suits that you buy for wedding and other important occasions should be selected with the help of the others who knows better about suits as you can afford to make even a small mistake in this matter. Always go for a trial before buying a suit just to make sure how you look in your new costly attire.